Please allow 24 hours for your booking to be confirmed. 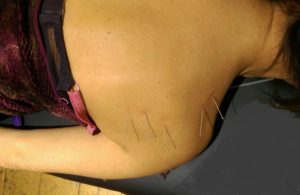 What is Medial Acupuncture/ Dry Needling and how can it help you? Dry needling is the use of solid filiform needles which are very thin (2.25mm in diameter) to penetrate the skin and underlying tissues to manage pain, tension or dysfunction of muscles to reduce pain and improve movement. The insertion of the needle is shown to stimulate the body’s natural healing process and can be used on muscles, fascia, tendons and ligaments. The results are pain relief and a restoration healthy tissue. Research has shown that dry needling improves pain control, reduces muscle tension, and causes a natural biochemical effect that facilitates an accelerated rehabilitation. The main use for dry needles is on trigger points, which are knots of pain in the muscle which when pressed by a manual therapist causes pain that is strangely relieving. However, applying pressure takes physical work by the therapist for some time and can leave the area feeling sore and bruised for several days. Whereas inserting a dry needle into the trigger point and leaving it there between 1 and 5 minutes is not only relatively pain free, achieves better results and does not leave any muscle soreness. However, I have trained in Functional Integrated Dry Needling (FIDN) – so what is the difference to ‘normal’ dry needling? Normal dry needling is done on trigger points, but what if there are no trigger points? FIDN is a new phenomenon which is done not only on trigger points but also tender points. FIDN also follows peripheral nerves and therefore the flow of pain pathways. FIDN is also done on vertebral discs and the cartilage of the knee and has been shown to improve disc and cartilage degeneration in some cases and a reduction of pain. 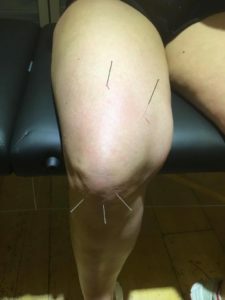 Is functional integrated dry needling (FIDN)for pain management and functional rehabilitation the same as acupuncture? No, FIDN is a neurophysiological evidence based treatment which is scientifically based on anatomy, physiology and biomechanics of the human body. Acupuncture is based on meridians as per ancient Chinese techniques. What sort of conditions is functional integrated dry needling good for? As with dry needling, FIDN is excellent for relieving tension in muscles. Their use on trigger points can reduce the massage therapist’s time in trying to manually press on trigger points, often using their elbows which can be uncomfortable for the client, in the efforts to get muscle to relax. Dry needling can be easily incorporated into a massage treatment for sore neck and shoulders and/or lower back pain, and leave the massage therapist more time for the pleasant, relaxing part of the massage treatment. Stiffness and excessive leg swelling. FIDN has many biochemical effects that leave the patient feeling relaxed, with a feeling of wellbeing and sometimes sleepy. Do you want to become a mobile massage therapist? Read on…. Read your message sent to Russell Rogers, also seen your treatment on the Web. For your Info:- I have tried, practically all, and had ENT, Scan, Acuncpuncture, Osteo, Physio etc. I just wanted Relief to my Stiff Neck and Jaw on the rightside only, At night, quivers to the mouth, not in the day. I don’t get severe pain, just Uncomfortable trying to relax. My Legs feel the cold when I go outside, and makes me feel unbalanced. I just need a good massage and manipulation. Please advise, Thanks for your prompt reply to Russell my Son. Hi Claire, You are doing a wonderful job by doing a treatment of the severe condition by massage therapy. It is actually very important to aware people about Massage Therapies to keep them away from dangerous medicines. 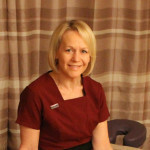 I am a mobile massage therapist specialising in Sports massage, Swedish deep tissue relaxing massage therapy and Reflexology. I service Christchurch, Bournemouth, Ringwood and the New Forest areas.